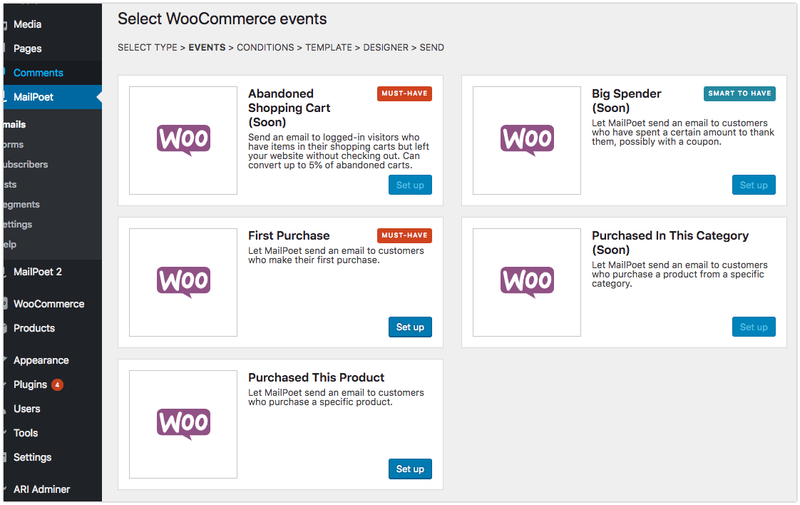 MailPoet allows you to create four different types of emails: Newsletter, Welcome Email, Latest Post Notifications and WooCommerce. Each one has a different purpose and you can read more about it in this article. A simple standard newsletter you can manually send immediately or schedule it to be sent at a later time. This is in contrast to the two other email types (Welcome Email and Post Notifications) which are automatically sent whenever a specific event occurs. Standard newsletters are useful for sending individual, non-recurring emails to your subscribers. If you want to automatically send the same newsletter on a regular basis, you should use a Welcome Email or a Post Notifications email. You can choose how quickly you want to send Welcome Emails: immediately or a certain number of hours, days, or weeks later. It's also possible to use the Welcome Email to create an automatic series of emails. 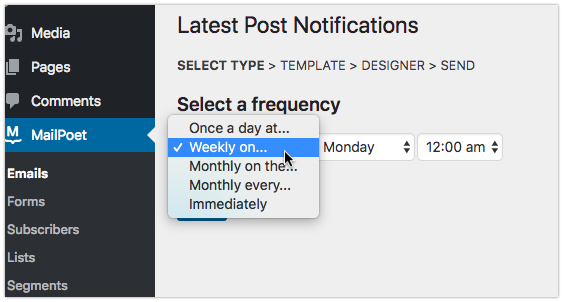 Using Latest Post Notifications you can automatically send your latest WordPress posts to your subscribers. In other plugins and services, this feature can be called Post2Email or RSS-to-Email. When choosing to send it immediately, you'll send an email newsletter each and every time you publish a new post. If your publishing frequency is more than one email per day, we recommend picking a different frequency to avoid sending your subscribers too many emails. Please note this option is part of the Premium features in MailPoet 3. If you want to buy a Premium license, check our Pricing page.